I toured Cleveland State University as part of my elaborate plan to see a concert at the House of Blues in Cleveland during February of 2012. That concert was Allstar Weekend, in case you were wondering and wanted more details as to who I was as a sixteen year old girl. My mom went to law school in Cleveland and lived here for three years. My parents were somewhat familiar with the area (though, if you've been following along, Cleveland has had some major expansions not only over the course of my four years here, but the twenty odd years it has been since my mom lived here). I grew up with neighbors who were diehard Cleveland Browns and Indians fans. I've gone to a few concerts here...okay, so just two Jonas Brothers concerts and one solo Joe Jonas show in 2011. Anyways, I've just always associated Cleveland with positive things in my mind. I didn't want to apply to schools in New York City. I didn't grow up in a rural area by any means, but Niagara Falls is not a massive city and Buffalo is not exactly the ideal metropolitan area to grow up in. It's a city and there's a lot of people, but it doesn't have that city vibe, in my opinion. Not yet, anyways. I was also only seventeen when I started college, still shy, timid, afraid to step outside of my comfort zone. New York City would've swallowed me whole, even if I knew that that was where I ultimately wanted to be. I had to train to be in New York, mentally and emotionally. So I decided that I needed a stepping block. I looked at schools just outside of New York City, but those areas seemed too small for me. I was really set on Boston for a while, but ultimately wasn't in love with the schools I toured there. I considered it, I really did, but I decided that Cleveland State University was the best fit for me. It was in my price point, only a few hours away from home, and was just big enough where I didn't feel like I was stuck in rural prison. 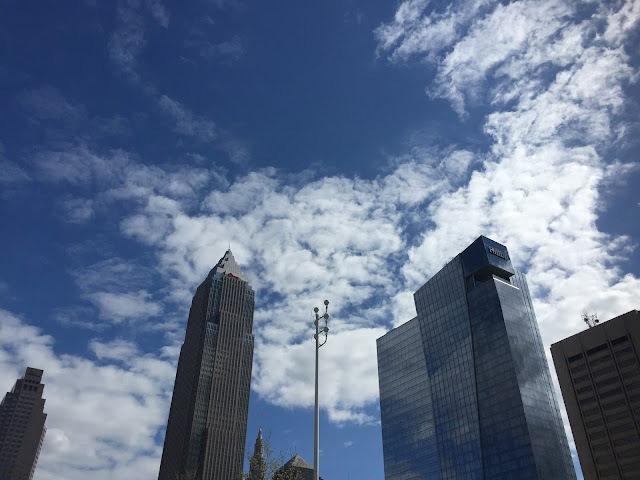 If you're unfamiliar with Cleveland State, it's main campus buildings only take up a six-block area of downtown Cleveland, from East 24th to East 18th on either side of Euclid Avenue. On East 9th and a block or two over on Ontario Street, there's Progressive Field, home of the Cleveland Indians. Right across from that is Quicken Loans Arena, home of the Cavaliers and concert arena. On the opposite end of East 9th near the waterfront, there's a pier and First Energy Stadium, home of the Browns. In between all of those places, there's coffee shops, restaurants, grocery stores, pharmacies, anything you'd possibly need. And everything just keeps expanding. Demand to live downtown grows as the years pass by. There's more apartment buildings now than there were when I toured for the first time five years ago. They've rebuilt and redesigned Public Square, a public park in front of Tower City Center, a sad shell of what once a luxury mall. So why Cleveland? At first, because it was affordable and close to home. But as I've talked about before, I wanted to transfer my first two years. Freshmen year I missed my friends and family and just wanted to move home. Sophomore year, it was because I thought I was in the wrong program and wanted to study fashion at Kent State University. But I ultimately stayed. I fell in love with Cleveland. I loved that it was a little rough around the edges but still constantly grew and expanded and improved itself. So much has happened downtown over the past four years that I can't even begin to go into detail about all of it. Campus has expanded, class sizes have gotten larger. New apartments are being constructed, new restaurants are moving in. Cleveland is booming, or at least, it's on its way. Sure, you have to head out to the suburbs to shop and sometimes things aren't open on the weekends because downtown is still very much a business hub, but I wouldn't change my living location for the world. I love that I'm only a twenty or thirty minute walk from anything that I might need. I love that if it's cold, my Uber rides can be under eight bucks to get somewhere I need to go. I love that all I had to do when the Cavaliers won the NBA championship was walk outside of my building and just walk down Superior Avenue, no crazy parking job required. I'm going to miss this city. I didn't think I would love it as much as I did. Or, do, I should say. It's always going to have a special place in my heart. I love the people, the sports teams, the food, the lake (even if it makes everything like six million degrees colder)...all of it. I've cherished my time in Cleveland, but it's time that I let it go. It's been real, Cleveland. Let's have one hell of a last week!